Here you’ll find illustrations I made for my new podcast project ‘Sens Créatif’. A podcast about creative carreers and visual arts. You can also listen to it by subscribing on iTunes. Every month, I create an illustration according to the monthly theme for the brilliant Creative Mornings in Paris. Vie perso : la vie sans internet. Various illustrations I do for various reasons. San Francisco based tech company SETKA asked me to illustrate the article ‘10 Insights On the State of Visual Storytelling in 2019’. You can read the article on the ACCENT website. Based on Brené Brown's book Braving the Wilderness, here you'll find some editorial illustrations I made going alongside my articles which you can read on The Illustration Book Club. You can watch a video of the zine release party here or buy an issue here. Le tour de la question / Le prélèvement à la source : bonne ou mauvaise mesure ? In September 2018, I launched my first KICKSTARTER campaign in order to get some funding to print my second zine ‘Braving The Wilderness’. Fully DIY, I really enjoyed working on the lettering and the animated gifs. Braving The Wilderness - le zine illustré ! Lately, I started to play around by drawing funny letters on photos. During the summer of 2018 I went to ICON Conference in Detroit with my good friend Andy J Pizza. Here’s a “written” summary of my trip. I hope you enjoy it. The French book publishing company Editions Eyrolles asked me to illustrate the cover and make some inside illustrations for the book “J’arrête de subir mon passé” (“I decide to stop suffering from my past”). The topic was interesting and I’ve really appreciate working with them. Absolutely loved making this illustration for Belgian newspaper De Morgen. The article was about how since the eigthties credits for pop songs from famous singers has risen from two authors to - sometimes - seven authors for just one song! Freyssinet asked me to create 3 illustrations for their 75th birthday anniversary they celebrated at the prestigious French museum Le Musée d’Orsay. They represent various projects they worked on over the years. I had the pleasure to be selected alongside 19 other talented illustrators to illustrate a bottle of Heineken with the colours of my country. This was for a limited edition series during the campaign “Le brassage est une richesse”. For more information about this campaign, please visit this website. It’s the fifth year Le Patadôme Théâtre in Irigny (France) and I are collaborating together. Here are two illustrations I made for the 2018-2019 season. It’s printed on some nice copper-coloured paper! 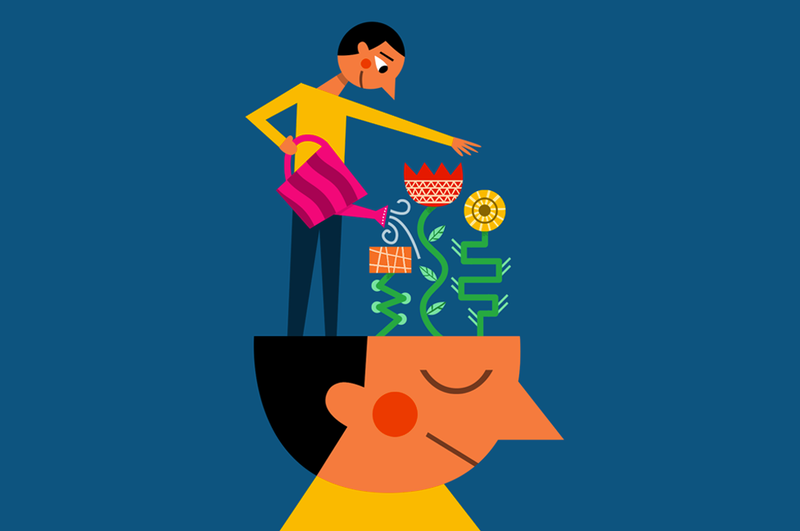 Editorial illustrations for The Culture Trip website. In April 2018, I had the pleasure to be featured on Adobe France’s Youtube channel and talk a bit about my work and illustration process. Thanks again to Franck Payen for this fun adventure! In April 2018, I had the pleasure to be featured on Adobe France’s Youtube channel and talk a bit about my work and illustration process. Des vers oui... du vert non ! 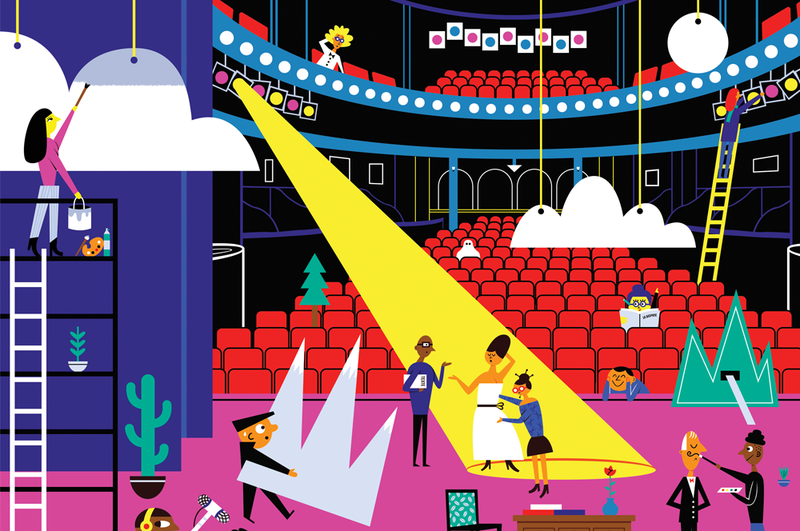 Editorial illustration for Georges magazine, on the fantastic world of theatres. I was commissioned by the British Council France to create a visual for a conference about kid's multilingualism. The idea had to be simple and the colours childlike. Dossier : Faut-il investir dans les résidences-services ? A series of portraits : Myself, Brené Brown, Queen Elizabeth II and two friends called Lise and Grace. Illustrations I do for the French lifestyle blog Le Chat Urbain. This first illustration is for an article about new year's resolution 2018 to see the glass half full instead of half empty. Illustration of the children's song "Gouttes, gouttelettes de pluie" for kid's magazine GRAOU (issue #grenouille, February 2018). Editorial illustrations for Le Particulier, about school bullying in France. Editorial illustrations for Causette, about the "Name & Shame" in French enterprises, a technique used to shame bosses who badly pay their employees, especially women. Based on Brené Brown's book, these are personal editorial illustrations I make to go alongside my articles on vulnerability which you can read on my blog. Editorial illustrations for XXI, based on Alexandre Lévy's short story "Le numéro de Petrov". The tale of an abusive experience with the secret services in Bulgaria in the late 80's. Book cover illustration for Flammarion. Editorial illustration for La Revue du Portrait, based on Sophie Divry's short story "Cocaïne". A bunch of illustrations going alongside some articles I've written regarding freelancing, which you can read on my blog. I got hired by YCN to do an illustration part of an exhibition for an event organised by Viacom. I had to make an illustration based on the American kids series "Nicky, Ricky, Dicky and Dawn". I got hired by the french ministry of cultural affairs to create a bunch of illustrations for a booklet about social media. Facebook, Twitter, Instagram, etc. it's all in there babe ! Movie director and good friend Michael Terraz asked me to illustrate the end credits of his 2016 short movie "Le goût des choux de Bruxelles". It was a pleasure to work on this and the short movie is definitely worth watching too ! Motion design : Michael Terraz. 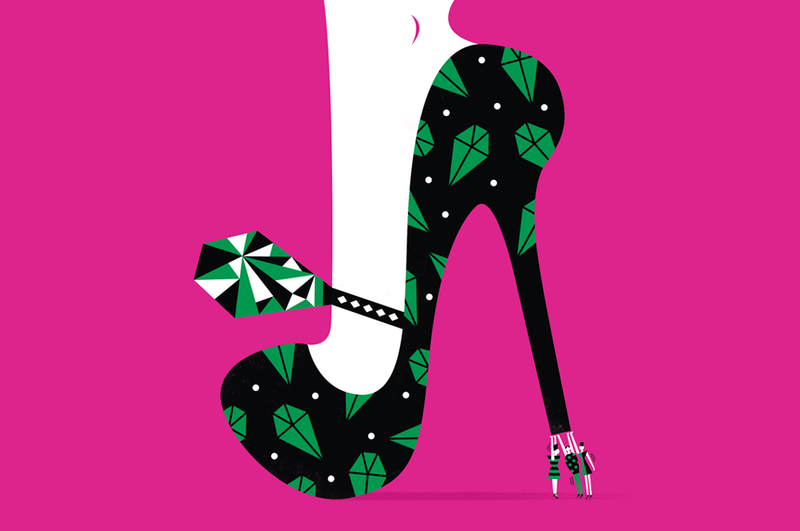 An editorial illustration created for a special issue of french magazine Georges for the Louis Vuitton institution. Soletanche Freyssinet asked me to illustrate their team tshirt for the 2016 Odyssea race against breast cancer. Each month, I make pictures for the mediation app Mind. The excellent website Maison Tangible asked me a few questions and requested three original stamps for their interview collection "L'interview Timbrée". I had lots of fun making these collages. I love movies and series. Here are a few personal pieces I made based on some of my favourite ones : The Big Lebowski, Blow Up, Take Shelter, Los Abrazos Rotos, Citizen Kane, Stranger Things and The Crown. Editorial illustrations made for childrens magazine Filotéo and I Love English World. In November 2014, I started a personal project called #100WEIRDFACES. The deal was to create one character a day until I reached 100. It took me longer than planned, but I learned a lot in the process. Here's a selection of pictures of 19 months of small experimentations. The video was made in collaboration with my good friends Jouak for the animation and Adri for the music. Editorial illustration for the French lifestyle website MERCI ALFRED. Cover illustration for the monthly magazine of "Le petit ballon". A website delivering two very nice bottles of wine every month. Editorial illustration for french kids and movies magazine PopCorn. The article was about movie-composer John Williams. Promotional mug for Strasbourg-based agency Novembre. Two years in a row, Freyssinet France asked me to create an illustration for their annual convention. I loved working on it and they were really fun to work with. A few T-shirt illustrations I made for French collective of artists Majestart.